The love of Zion in the hearts of American Jews was given ideological and practical expression in the last decades of the nineteenth century when the Hovevei Zion (Lovers of Zion) movement took root in the Jewish immigrant community. Support for colonizing the ancient homeland was expressed through ideological pronouncement, philanthropic endeavor, and personal participation. From the rich store of early American Zionist material, we choose a manuscript and a pamphlet. By vocation, Ralph B. Raphael was a manufacturer of fine hair jewelry; by avocation, he was a writer for the early American Hebrew periodical press. in such periodicals as Zev Schur's Ha-Pisgah, he addressed himself to contemporary issues confronting the East European Jewish immigrant community in America. Raphael, a resident of Pittsburgh, was an early member of the American Hovevei Zion movement which, though small in number in the 1880s and 1890s, made a significant contribution to Hebrew culture in America and laid a foundation for the following century's Zionist activities. The American Lovers of Zion published periodicals and organized the first modern Hebrew schools in America, but the center of their devotion was the growing yishuv (the pre-State Jewish community of Palestine) of pioneers who were founding agricultural colonies in Palestine and who declared themselves the vanguard of a mass return to the soil of the ancient homeland. Among the many constitutions of religious, charitable, fraternal and cultural Jewish organizations in the United States held in the Hebraic Section is this of a society of Jews in New York, whose purpose was to establish and settle in a cooperative agricultural colony in the land of Israel. Articles 2 and 3 of its constitution, found on the page before us, state its purpose, "to colonize Palestine"; the number of its membership, 500 families; its capitalization, $150,000. The language of the constitution is Yiddish. Constitution of the Shavei Zion Society No. 2, New York, 1891. Hebraic Section. In 1893, Raphael published She-elat Hayehudim (The Jewish Questions), an early Zionist tract, part polemic and part vision. It argued that the only place the Jewish nation could live in peace and security, in well-being, and dignity, the only place its spiritual life could be renewed and enhanced, was Zion. Only through life in the Holy Land reconstituted as an autonomous Jewish commonwealth, Raphael argued, can a solution be found to the endemic anti-Semitism which afflicts Jews even in the enlightened West, even in free democratic America. Raphael is aware of the objections that have been raised to the Zionist dream, but he is confident that they can be overcome. He points to the already established agricultural colonies in Palestine, drawing an idealized picture of life on the soil, of entire families joined in an enterprise which straightens their backs, lifts their hearts, and transforms their very being. He hails the halutzim (pioneers) as the creators of the new Jew and a new society. For such an individual and such a society, no problem is too difficult, no challenge too great. Let us imagine, he proposes, that the idea of resettling the land wins the majority of Jewish hearts and wins supporters among the nations; that Jews of America will buy land for those who wish to settle, and Jews in other countries will soon join in the enterprise. To the degree that Jews will settle on the land and make it flourish, the nations look with favor on the enterprise. The nations of the world will appoint a commission of twelve judges to hear the claims of the various contenders for the Holy Land. Catholics, Greek Orthodox, Protestants, Moslems, and Jews make their presentations and pleas. After due deliberation the commission decides: Palestine is for the Jewish people. Above all other considerations, the enterprise and accomplishment of the new Jewish farm colonists "who have come to the land of their fathers ... settling it to earn their livelihood by the sweat of their brow" will have persuaded the judges. The president, vice-president and members of the Sanhedria must be Jews by birth. Published at the Newark press of Ephraim Deinard, who retained the second half of Raphael's manuscript, the two-volume manuscript in the author's own hand came to the Library of Congress as part of one of the Deinard Collections acquired by the Library through the year 1920. Deinard had a hand in an attempt by American Jews at the end of the nineteenth century to colonize Palestine. He was a founder of Shavei Zion No. 2 of New York, an organization to purchase land and establish a colony of American Jews in the Holy Land. The father of the Shavei Zion movement was Adam Rosenberg. Born in Baltimore in 1858 and raised in Germany, he returned at the age of twenty, studied law, and began to practice, but the cause of Zion rebuilt soon became his vocation as well as avocation. 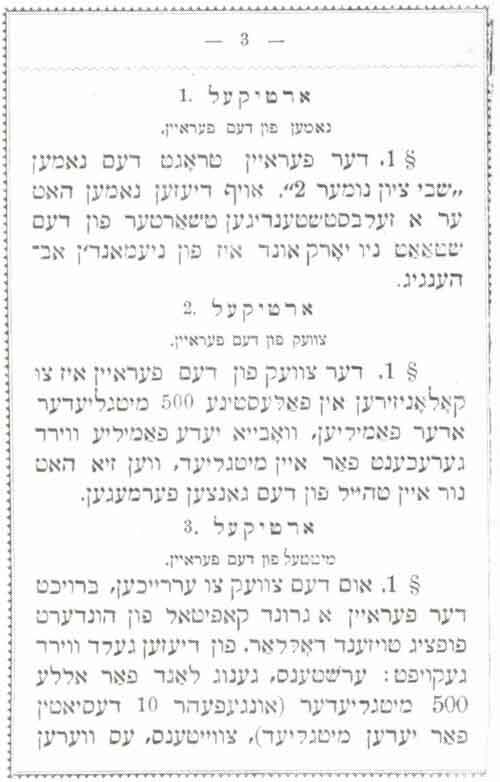 Based on the Russian Dorshe Zion Society, its American counterpart proposed, according to its bylaws, published in Yiddish: a membership of 500, each member to contribute 200 dollars in annual payments of 40 dollars or weekly payments of a dollar to purchase land on which to establish themselves as an agricultural colony. Within three months, a second group was formed in New York, then others in Boston and Montreal. in fulfillment of the dream of life upon the land in a Zion rebuilt, immigrants in America were ready to relocate again. In June 1891, Rosenberg travelled with two colleagues to Palestine to buy land, and building began, but poor planning and inept relations with the Turkish authorities brought the project to an early end. Constitution of the Shavei Zion Society No. 2, organized in New York, the first day of Sivan, 5651, June 7, 1891. "If I forget thee O, Jerusalem, may my right hand lose its strength." This, too, came with the Deinard collections, and, as Deinard's rubberstamped inscription attests, it was originally intended to become part of the Library in Jerusalem, but like the members of Shavei Zion, it never left the Land of Promise for the Promised Land.